Maria Farran and her husband, Sam Farran pose for a portrait in the square of their living complex on Feb. 3, 2013 in Alexandria, Va. The couple were locked in legal issues with their home owner’s association over a political sign and also over their deck and roof. The modest placard Sam and Maria Farran planted in their yard during the 2008 election put them on a collision course with the neighborhood homeowners association. It was four inches taller than the association’s covenants allowed. The battle lines in Olde Belhaven were starkly drawn. On one side, the Farrans said they were standing up to an HOA run amok. On the other, HOA supporters saw a couple that inflicted financial ruin on the association — and their neighbors — to make a point. Experts say such feuds are becoming more common with the tremendous growth of HOAs, which typically require residents to sign covenants governing architecture, landscaping and other matters when they move into an association neighborhood. The HOAs collect dues and often have the power to fine residents who don’t comply with the covenants. There were 10,000 association-governed communities in the United States in 1970, and by 2012 the number had reached 324,000, according to the Community Association Institute. One in five Americans lives in a neighborhood governed by an association. 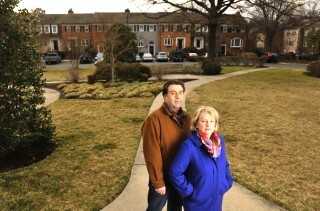 Sam and Maria Farran, a wine broker and a government lawyer, moved to the 44-unit townhouse community in the Alexandria section of Fairfax in 1999. In many ways, it is a typical Northern Virginia neighborhood, with tidy houses and a mix of government employees, service members and professionals. The townhouses line the three-quarter-acre square, which is the neighborhood’s central feature and the site of most community-wide events. Without the green plot, it might be difficult to call Belhaven a community. The Farrans said the HOA had a reputation for hard-line stances. In one case, board member Don Hughes compared some residents’ refusal to install window-pane dividers to the “cat and mouse game Saddam Hussein played with the USA,” e-mails show. Ultimately, Hussein “paid the price,” he said, concluding that the residents should comply. Nevertheless, the Farrans were surprised when letters arrived in October 2008 telling them and others that their political placards were too large. “This is our final request,” Hughes wrote on behalf of the board. E-mails show that Hughes pushed the board to act. He wrote that he was prepared to make a motion to put a lien on the Farrans’ house if they didn’t comply. He called sending a letter a “teaching moment.” Hughes declined to comment. The Farrans were angry. They acknowledged that the sign broke the rules but said it seemed like an assault on free speech to go after a minor violation during the height of an election. Their response: cutting the placard in half. They planted “OBA” and “MA” signs in their front yard. The prank did not amuse board members. And they decided to act. They passed a resolution allowing the board to fine residents up to $900 per infraction for violating HOA guidelines. Across the country, fining authority has been controversial, with HOAs hitting residents with levies for such transgressions as displays of colored Christmas lights and patches of dead grass. Board members believed that they had the right under Virginia law, but the Farrans saw an illegal power grab that had no basis in the HOA’s covenants. When the board, acting at a meeting that was not publicly announced, rejected the Farrans’ roof and deck projects for aesthetic and architectural reasons, the Farrans said it was retribution. The Farrans filed a lawsuit against the HOA saying it didn’t have the authority to impose fines and had vindictively rejected their home improvements. Board members were taken aback. They saw residents who wouldn’t abide by the rules that had made Olde Belhaven a great neighborhood and who were willing to resort to drastic action to get what they wanted. The legal fight consumed Olde Belhaven. “It was a crusade,” a supporter of the Farrans said. On the other side, board members said that the Farrans were unreasonable and that they declined numerous offers to begin settlement discussions. And as the case ground on, the HOA increased dues from $650 a year to about $3,500, mostly to cover legal fees. The Farrans said that they, too, had made attempts to settle matters but that those overtures were rejected by the HOA. The roof and deck issues, which had been spun off into a separate lawsuit, were decided in 2011. Another county judge ruled that the board’s votes to reject the home improvements were improper because they came at a “secret” meeting and followed arbitrary standards. The HOA was on the hook for about $100,000 to cover the Farrans’ legal fees, and it owed hundreds of thousands more for its own legal expenses. The HOA was financially ruined. LeBlanc said the association didn’t have the money to cover the bills, so residents voted for bankruptcy. Late last year, a court-appointed bankruptcy trustee put the community square up for sale to cover the HOA’s debts. The pleasant square, with its trees and benches, had in better times been the site of community picnics and Christmas festivities. Now it was a reminder of the community’s plight. A red-and-white “For Sale” sign drove home the point. A developer began negotiations to buy the plot but pulled out. The developer had received anonymous threats. Then, a former board president stepped in and put up a gift of $60,000 to facilitate a settlement. A judge approved the plan, but the Farrans filed a motion Friday opposing the settlement because it relied, in part, on the use of capital funds. What will become of the square remains an open question. But the damage was done. Large gatherings on the square have all but ceased, LeBlanc said. For now, individual residents are paying out of pocket for the plot’s water, electricity and maintenance. The Farrans have built their deck and their new roof. And Olde Belhaven is set to begin discussing what form the HOA will take as it emerges from bankruptcy. LeBlanc hopes the wounds will heal in time.